FCI Lender Services, Inc. (FCI) is a leading national Private Money Servicer providing a variety of services for Lenders, and one of the nation's oldest Specialty Loan Servicers. FCI has the distinction of being a national Rated Specialty Servicer with the highest number one Rating of MOR RS1, and a SOC 1 (SSAE 16) audit assuring reviewed compliance and processes for your safety. FCI is an approved Private Money, Freddie Mac (FHLMC), and VA Servicer that offers a full spectrum of Loan Servicing, Collection, Workout and coordinated Foreclosure services locally or nationally for all types of Loans, and is approved to receive existing HAMP modified Loans for servicing; (Private Label, FHLMC, or VA direct servicing and reporting may be available on portfolios of 10,000+ Loans). By partnering with the experienced staff at FCI, Institutional Lenders, Banks, Credit Unions, Private Money Lenders, Private Money Brokers, and Private Money Loan Servicers of any size can have all aspects of servicing their Standard Loans (secured or unsecured), Hard Money Loans, or real estate secured Delinquent Loans handled by FCI as the SubServicer acting at the direction of the Lender (Owner of the Notes). Outsourcing Private Money Loan Servicing to FCI frees up our clients to concentrate on building their businesses. Let FCI become your professional back office. Our programs are designed to reduce overhead, replace variable costs with predictable fixed costs, minimize the risk of costly overstaffing, reduce liability, give the benefits of the finest systems available, and give the Private Money Broker, Originator or Lender a very professional look. A significant benefit of using FCI for Private Money Brokers, or Institutions, is the increase in Investor confidence and trust that comes with knowing a significant independent third party Rated Servicer is handling their money. View a cost/income comparison of Outsourcing vs. In-House processing including income producing Servicing. FCI’s Live Customer Login sets an industry standard for information access, transparency and full disclosure. Private Money Lenders, Brokers and Mortgage Fund Managers can access all their Loan information and see payments received, funds disbursed, Late Letters, collection and account notes as they happen. Clients are also able to sort data to create dozens of custom views and export to Excel to create custom reports. 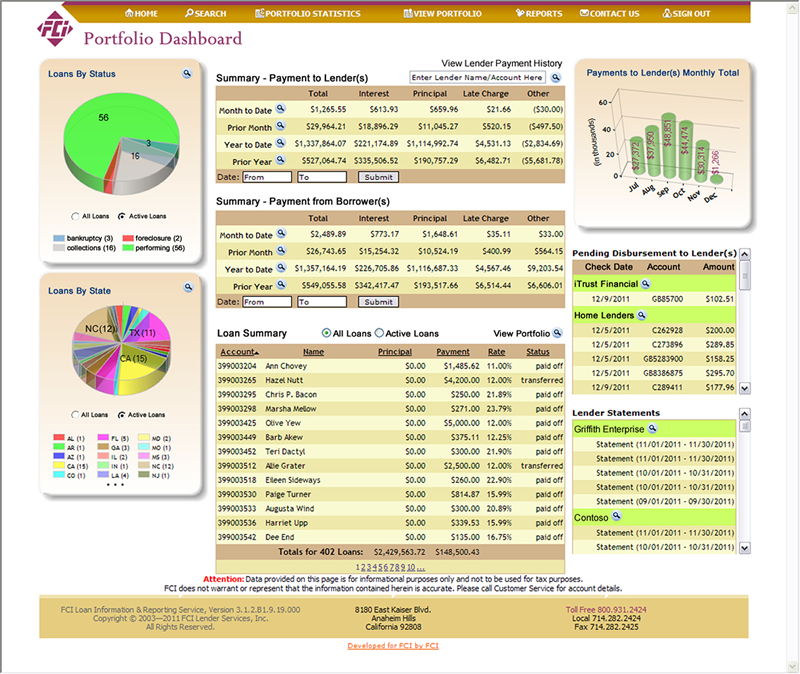 See a sample Dashboard. This is a full disclosure web site. All of our programs, forms and primary pricing are included. FCI’s pricing structure on all programs is designed to be significantly less than the cost of sophisticated software, hardware, qualified personnel, office space, and the liability that comes with in-house processing. Click the program of interest on the left for the program description and pricing. Since 1982 FCI Lender Services has offered a comprehensive family of services to the greater Private Money industry. FCI and its experienced staff have earned an industry wide reputation for professionalism and results. View more about our history and staff at About Us. Please be advised that FCI Lender Services is a debt collector, and is attempting to collect a debt. Any information obtained will be used in furtherance of that purpose.